The launch of Svara marks the next generation of unitary fans. Home owners have complete control of their indoor air through an intuitive App designed to give them flexible options on how to run the fan. Giving home owners this control has the added benefit of removing the need for multiple returns to the property post installation should the fan not be set up quite to the householders’ liking. For example the humidity setting being too sensitive. The home owner can simply log on to the App and change the setting themselves. For electricians, installation is made simple through Svara’s Bluetooth-enabled App allowing you to choose whether to opt for intermittent or continuous ventilation; whether you would like the humidistat to trigger operation or not; and whether the overrun timer is required. No more fiddly switches and jumpers! The name Svara takes its influence from the fan's Swedish heritage - a country well known for iconic and well thought out designs. Consumers will be attracted to Svara’s good looks with its sleek modern design, plus with noise a key issue for consumers, households will also be impressed by Svara’s quiet running, operating at just 17 dB(A) on low trickle. 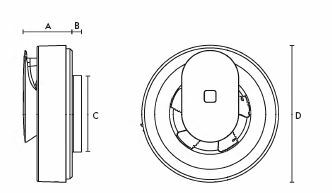 It is also easy to clean as the central module disconnects the motor from the rest of the fan allowing it to be simply wiped with a soft cloth, and at only 4W the energy efficient Svara also boasts low power consumption. Vent-Axia Svara is programmed to cope with the vast majority of installations. Because of this, it can be fitted in either a bathroom or Kitchen and can be set to run either continuously or intermittently. The silent hours scheduling function allows you to deactivate the boost function on the Svara via the App, for example, this would prevent nuisance noise over night. Additionally during a vacation you can set Svara to an airing mode which operates a purge function every 12 hours for either 30, 60 or 90 minutes depending on selection. However, Svara’s sophisticated controls, will not purge if the light sensor detects that there is someone in the house. 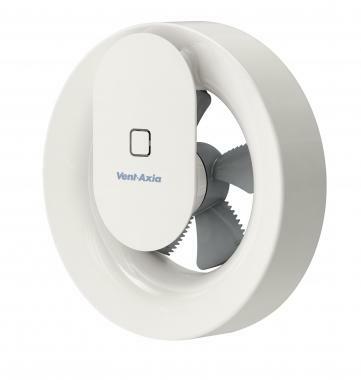 The fan’s features can easily be altered by downloading the Vent-Axia Connect App to Android and iOS devices. 100 mm Axial fan. Factory set at continuous running with Humidistat and Light Sensor/overrun timer On.